This is the first of what I intend to be a monthly post where I share a few things that are either a new release, or a series return, or maybe even an event for the month. June marks the start of the northern summer, so over the next six weeks we’ll see a whole lot of new and returning TV in the USA, as well as the summer blockbuster movie season. Needless to say there’s plenty to look forward to for screen junkies. I’m not really a huge Beach Boys fan. I like the hits, and I have a weird connection to the 1989 song ‘Kokomo’. I will tell you that story because I’m pretty sure you can’t just say you have a weird connection to the song ‘Kokomo’ and leave it at that. To start at the beginning, as a small child (I mean like, 2 years old small) I had a video tape – yes, a VHS kids, something some of you may never have seen before – that basically consisted of a recording of an episode of the legendary ABC music video show Rage. I watched this tape with alarming regularity. However, the tape (yes, tape) began with the opening titles of The Addams Family. Not a full episode of the show, just the titles. Weird right? (Incidentally, just before the titles begin there is a commercial for that icon of 1980’s Australia; Fairstar, The Fun Ship) I believe the story goes that the preceding summer had seen Channel 9’s usual 7pm programming of Sale of the Century replaced by re-runs of the original 1960’s series The Addams Family. In 1989, my bedtime was 7pm, and I had become accustomed to being alerted to my bedtime by seeing/hearing The Addams Family theme song. So it was really a stroke of genius that my parents realised that the shows run would end with the return of the ratings season, and recorded it, in order to avoid a disruption to this routine. Apparently it worked like a charm, I heard those clicking fingers and off to bed I went (Look, probably with more fuss than that, but you get the picture). Next up were a series of music videos, which actually now serve as a pretty cool musical time capsule. The tape features classics such as Sweet Child O’Mine by Guns N Roses, Simply Irresistible by Robert Palmer, and Rock n Roll Music by Mental As Anything, from the film Young Einstein starring Dr Yahoo Serious. Ok, maybe not that last one, and yeah that guy has a PHD. Look it up. One of the first videos on there is for Kokomo, featuring a very young Tom Cruise as it was from the Soundtrack of Cocktail. I can’t tell you how many times I watched this video as a kid, for many years beyond 1989. I had no choice but to love that music and there are just some songs that have stuck with me as a result. Kokomo is one of them. The connection doesn’t stop there, oh no. I recently learned that the Beach Boys concert sections of the video were filmed at the Grand Floridian resort in Walt Disney World the week before it opened. My theory is the video sent subliminal messages to me, which manifested in Walt Disney World being my spiritual home. So what does any of this have to do with Love & Mercy? 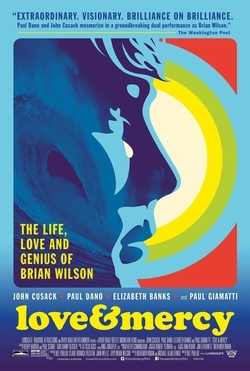 If you haven’t seen a trailer, or read any of the reviews from it’s American premiere at South By Southwest, Love & Mercy is the story of Brian Wilson, with the younger 1960s Brian played by Paul Dano, and 1980s Brian played by John Cusack. If you didn’t already know, I’m sure in time this blog will illustrate that I am a HUGE John Cusack fan. There are very few things that can’t be made better by watching a John Cusack movie. Naturally, I have very high hopes for this film. It also stars Elizabeth Banks and Paul Giamatti, both of whom have done some exceptionally good work in their careers. It’s currently sitting on 83% on metacritic, and received quite favourable reviews from the 3 festivals it has played at. I generally love biopics, and I think with a cast this solid and the story of a music legend, it will be hard to go wrong. I love Netflix original programming. I think they’re making innovative, brave and most importantly, wildly entertaining television without the restrictions of networks and advertisers and all that goes along with the traditional model. I was a little late to the party with Orange is the New Black, but once I started I made my way through the first two seasons rather quickly, and now I am like the rest of the fans of the series – hanging out for season 3 to appear on my ‘recommended for you’ section. If you’ve never seen it, OITNB is at its core, a black comedy. It’s hard to imagine there is much to laugh at in a womens prison but OITNB achieves this, as well as its often heartbreaking moments through its exceptional character development. We love the characters we love (Alex Vause FTW), we love some of the characters we hate (Pensatuckey), and we hate the ones we really hate (I’m looking at you V). I don’t want to spoil anything here, but if you’ve seen the final episode of the second season, then you’ll know that is was well and truly worthy of the very loud exclamation & fist pump I gave the final scene, whilst watching alone in my room. It also ended with a few cliff hangers to keep us on the hook for season three. I’m excited for the addition of our own Ruby Rose to the cast (ask me about the time that me and two friends ended up at her birthday party at the Spice Market, dressed like we’d been at her earlier birthday party at Globe HQ, and how very unimpressed the VIP host was about having to let someone wearing, jeans, white and gold studded sneakers and Michael Jordan Chicago Bulls basketball jersey past the rope). I think she’s cool, and she was really sweet to me the one time I met her, so I’m happy for her to be doing so well! 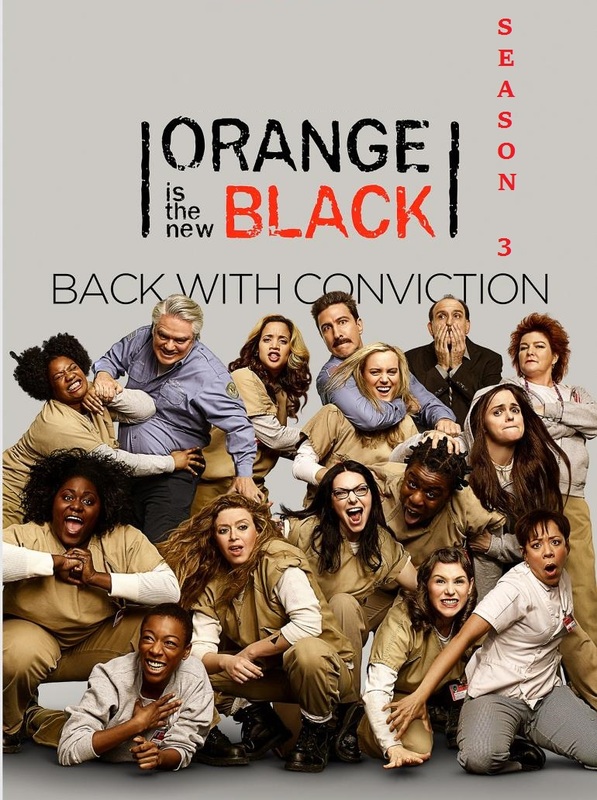 There’s still time to catch yourself up on all the goings on of Litchfield Penitentiary before season 3 hits. I think it’s worth the price of a Netflix subscription alone. I don’t know that there’s much I need to say about this upcoming release from Disney Pixar other than it’s made by some pretty incredible geniuses at the House of the Mouse who very rarely, if ever, put a foot wrong. I love the concept of this movie, and from the trailers I’ve watched it looks like it carries that trademark Disney/Pixar feature of family friendly comedy, jokes made purely for adults and poignant moments that speak to the human condition. It’s no surprise that it has a really impressive voice cast; Amy Poehler, Paul Rudd, Mindy Kaling, Diane Lane, Bill Hader…the list goes on. I’m a huge Disney fan and I’m pretty much on board with whatever they want to do, but I think that any film that helps kids (and adults, to be honest) understand their emotions and how to live with them is going to be a valuable piece of entertainment. ← What is going on in Wayward Pines?